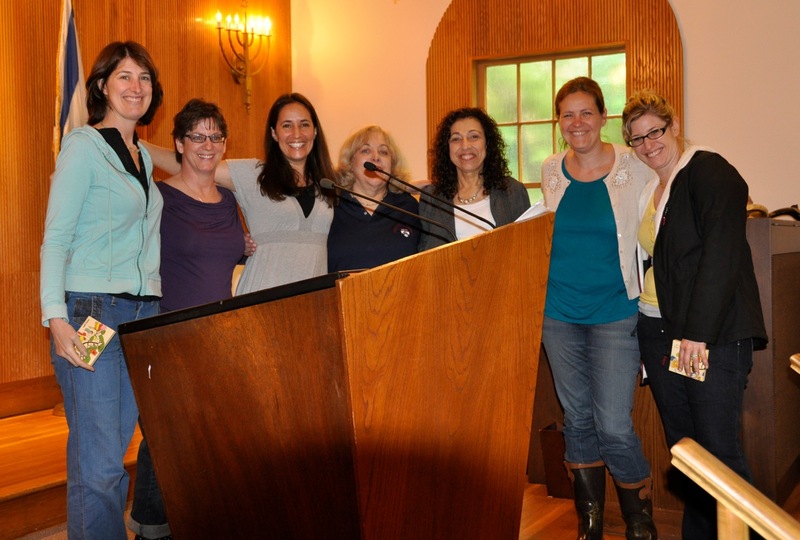 That's Cantor Shapiro on the left, next to her is Trustee Amy Chartoff, Chair of our Education Committee, and next to her is Jennifer Katz-Goldstein, the Director of our religious school, and they are joined by four of the outstanding teachers that grace the Adas Emuno Religious School. Wishing everyone a restful and productive summer vacation, and see you in September! In our previous two posts, we brought you Hannah Weinstein's Confirmation Speech and Sydney Labombarda's Confirmation Speech, both delivered this past Shavuot, June 7th. 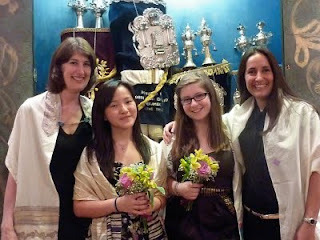 Here now are two lovely photographs, courtesy of Robyn Labombarda, with (from left to right) Cantor Shapiro, Hannah Weinstein, Sydney Labombarda, and our Religious School Director, Jennifer Katz-Goldstein. And yes, that is our beautiful new Ark that they are posing in front of! The Ark, a gift from our Conservative cousins in Leonia, Congregation Sons of Israel, will be featured in a future post here on our congregational blog, so keep an eye out for it! And one more time, congratulations Hannah and Sydney! On March 8, 2008, many of you sitting here thought that I was ending my Jewish education when I was called to the Torah as a Bat Mitzvah. In fact, on that date, I decided to continue my studies in order to become a responsible adult in the Jewish Community. In order to do so, for the past three years, I have been attending confirmation class. In confirmation class, we studied how issues that the youth of today are facing are viewed by the Jewish community based on the Talmud as well as Rabbinic texts. We also learned how our faith and our personal beliefs influence the choices we make when faced with tough decisions. By applying what we learned in confirmation class, we can become more responsible teenagers. Confirmation class gave all the students attending a safe-haven to discuss our views on topics that varied from cross-dressing and tattoos and piercing, to controversial and eye-opening discussions such as online harassment and life after death. By attending confirmation class, I was able to think freely as a Jewish adult and make better decisions in my life. 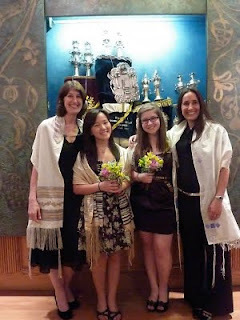 On Shavuot, students who have completed confirmation class become confirmed members of the Jewish community. This ceremony is held on this holiday, because Shavuot is when G-d gave the Ten Commandments, his rules for society, to the Jewish community. It is also when Jews around the world, read from the Book of Ruth, from the sacred scrolls. What makes confirmation important to me is, unlike my Bat Mitzvah, when I, as an individual, became a daughter of the Torah, the completion of confirmation affirms my beliefs and faith in my Jewish community. Unlike my Bat Mitzvah, where I was up here alone, as an individual, I am up here today, with Hannah. We stand before you, as part of the community, like Ruth was part of her community when she stood by Naomi, like the Israelites stood at the foot of Mount Sinai when they received G-d’s Commandments. We stand here now able to fully apply all that we have learned in class, all that we have learned from the Commandments, and all that we have learned from our families to our lives so that we can continue to be responsible, respectable and productive members of both our Jewish community as well as our home community. Amen, Sydney, Amen! And on behalf of Congregation Adas Emuno, a hearty congratulations to you and your family! Before I became a member of Adas Emuno, I did not know there was such a thing as a Confirmation after a Bar or Bat Mitzvah. I chose to continue my Jewish studies and to become Confirmed. Confirmation with Jennifer was very different than other classes because we got to talk about horoscopes, cyber-bullying, cross-dressing, Sydney’s favorite, piercing, life after death, and much more. Confirmation helped me take a stand on these topics by relating them to everyday life and by talking about Rabbis’ points of views. Confirmation class was a place where we could voice our opinions without the fear of being judged. I would like to thank Jennifer Katz Goldstein for guiding me further in my Jewish studies. Jennifer has always made Confirmation class interesting, fun, and I have always looked forward to them. I am so glad that I got to spend time with you in my last years of official learning at Adas Emuno. I would also like to thank my two wonderful parents for supporting me in everything I do. I made the choice to go to Hebrew School, to become a Bat Mitzvah, and to go on to being confirmed, and my Mom and Dad never hesitated or questioned me in my decisions. And a very special THANK YOU to my wonderful, amazing, extraordinary, one and only Dad, David Weinstein, who is the best dad on the face of the Earth. Lastly, I would like to thank our amazing Cantor Shapiro for all that she has done for this congregation and me. Cantor has made this congregation very special and I will miss her very much. This night is not only about celebrating Confirmation, but also is Shavuot. This Torah portion is about the Ten Commandments. It is said that G-d asked all of the different people of the Earth if they would accept the Ten Commandments but only the Jewish people said yes. The Jewish people vowed to follow the Ten Commandments as their law and practice. And just like the Jewish people many years ago, I promise to continue following Judaism for the rest of my life, and to pass it on for generations to come. Well said, Hannah, and congratulations, on behalf of the entire Adas Emuno community, to you and your family! Join Naomi Less for a rockin trip through the Ten Commandments. We've brought the decalogue to life with the amusing exploits of some villagers and their mischievous ways. Created in honor of Shavuot, the holiday when the Jewish people commemorate receiving the Torah (Law) at Mount Sinai. Wishing everyone a chag sameach, and a special congratulations and mazel tov to our confirmands for tonight!